Special District Libraries present an annual budget to a vote. If passed, budget needs are met 100%, no surprises. Other library structures typically struggle to fund libraries 100% every year. When budget needs are unable to be met 100%, the services, staff, programming and hours end up the victims of budget cuts. When a library charter is dissolved and terminated all assets of that institution are turned over to the control of the New York State Board of Regents. Not the town of Woodstock. Not a new library of Woodstock. A state entity that oversees libraries will decide the fate of our current 105 year old library’s collection. When a government entity like a library is dissolved and terminated all civil servant jobs associated with that institution are dissolved and terminated as well. As civil servants, the staff may be required to reapply for their positions. It is possible that if there are civil servants ahead of them on the civil servant wait list that want to work for Woodstock Library, our current staff will not be rehired. 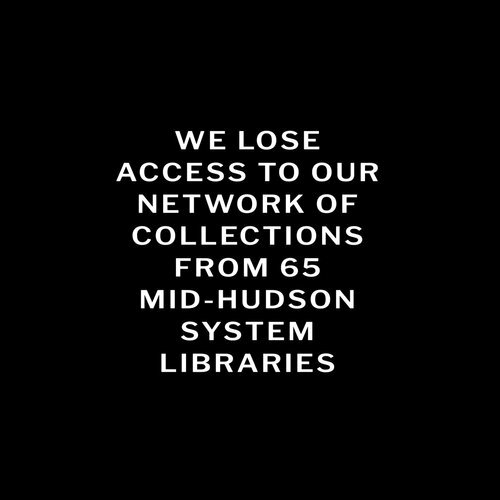 If the referendum passes our charter is dissolved and terminated, ending our partnership with the other 65 Mid-Hudson Libraries. This ends our access to their collections. The Board of Regents may not be in a huge rush to accept the new charter of a town who votes to dissolve and terminate their Special District Library. Special District Libraries are the number one recommended library structure by the NYS Board of Regents. Special District Libraries are the most democratic library structure in New York State. Taxpayers view a publicly disclosed budget. The budget details exactly how taxpayer money will be spent and the library is beholden legally to follow their budget. Taxpayers get to vote directly on the annual budget. If the budget passes, that budget becomes the library tax levy. The public also gets to vote directly on library governance. A Special District Library is beholden the staff, the taxpayer and the publicly elected Board of Trustees. Library Directors hold Library Science Degrees, not Political Science Degrees. With Municipal Libraries, the public does not get a say in who governs the library and they don’t have any ability to change the governance. Because of the ever changing political environment, Municipal Libraries are especially in danger of censorship.